An MP has criticised the BBC over the withdrawal of satellite TV viewing cards that will remove ITV1, Channel 4 and Five from hundreds of thousands of digital viewers. Labour MP Chris Bryant said the move would prevent many people from seeing some of the UK's most popular programmes such as Coronation Street and Big Brother. The three main commercial broadcasters are to fall off air in homes with satellite TV which access free-to-view programmes but do not subscribe to Sky services. This is happening because the BBC is no longer paying for the viewing cards that decode the satellite signals for more than 30 free-to-view channels. 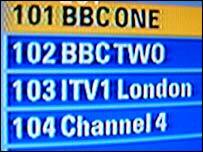 These include the BBC's own stations, as well as ITV1, Channel 4, Five and channels such as Sky News and CNN. From Thursday, the BBC began broadcasting its services unencrypted after moving to a new satellite - and the three main commercial services are unwilling to take up the cost. Chris Bryant, Labour MP for the Rhondda, said thousands of his constituents in the Welsh valleys would be affected. Many had switched over to digital because they were unable to receive Channel 4 or Five on analogue TV as a result of poor reception. Mr Bryant said the BBC had "unilaterally" decided to alter the system. "It's good for people in Westminster and Chelsea but not so good for people in rural areas and former mining communities," he told BBC News Online. "People have a right to see free-to-air things and the BBC has a responsibility to ensure universal access around the country." A BBC spokeswoman said the corporation was responsible for its own channels - but not for rival networks. "That's clearly a matter for the other broadcasters and Sky," she said. An ITC spokesman said it was up to the three terrestrial broadcasters to decide what action to take. BBC digital move: How will it affect you?